Indoor plants are a great addition to any room. They create a welcoming atmosphere, purify the air, and add some living color to space. But, I have learned over the years that the plants sold at my local home improvement center are not necessarily the best for growing indoors. They have been chosen for their immediate appeal, to sell quickly, and not for long-term success. Well, don’t worry, I’m going to set the record straight. 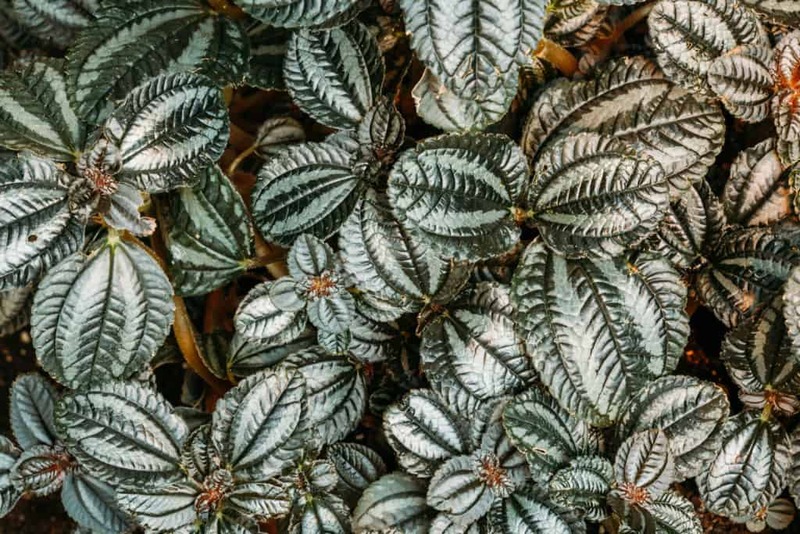 I have chosen 17 houseplants that will not only look great in your home, but they require little care and will do well in low light. These are plants that will be with you for years to come with a minimum of effort. You may even find that these are plants that help you sleep better at night! 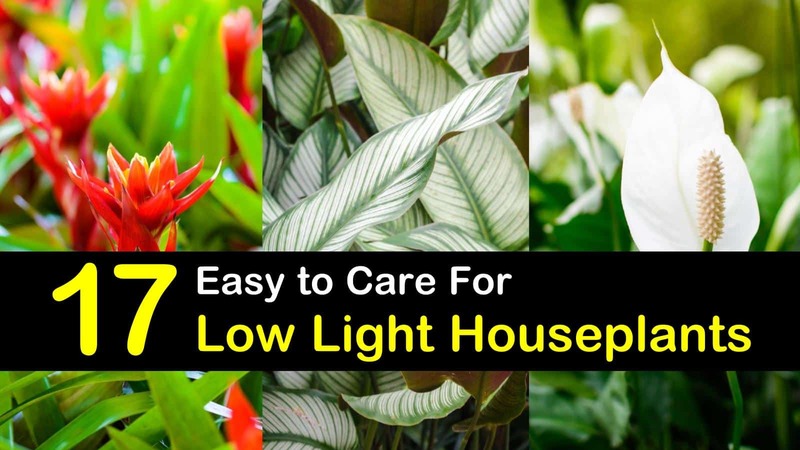 In this article, you will find the best low light indoor houseplants, an unusual tree for any size room, the best large houseplants for low light settings, and the most interesting houseplants. I also tell you what I love about each plant and why I recommend them. 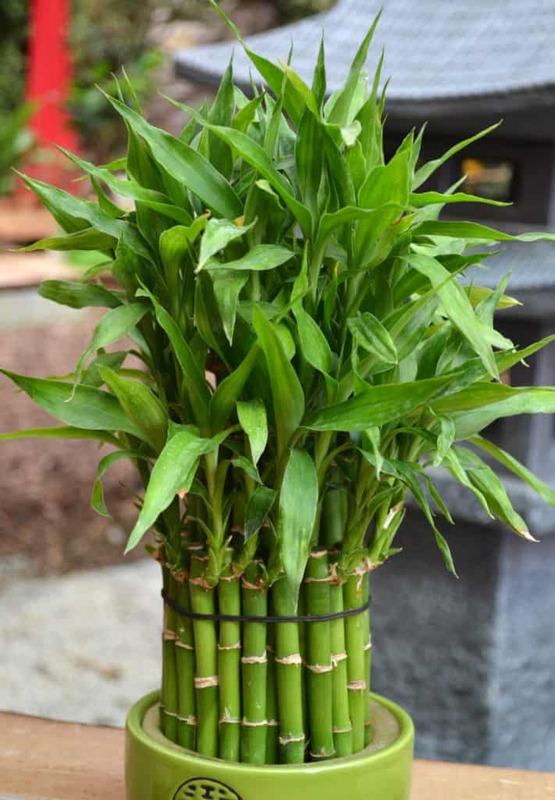 Lucky Bamboo, Dracaena sanderiana, is a sculpturally beautiful plant that is said to bring good luck to your home. The bamboo stem can bend into curls, braids, and other shapes. I love them for their artistic beauty and clean lines. You can find lucky bamboo that fits any décor or life theme. Give it an honored spot in a dim corner, it thrives in low light and will grow in soil or take root in a vase of water. 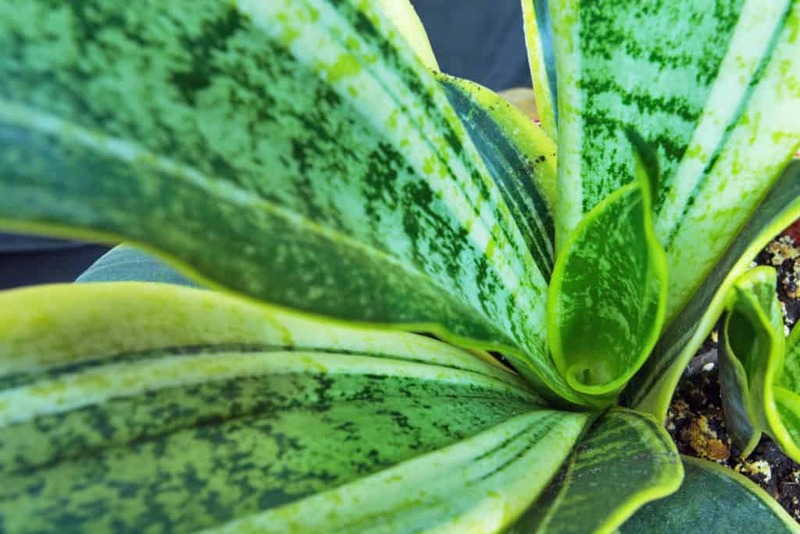 Anyone can grow s snake plant; it is nearly impossible to kill. I love its versatility and toughness. They thrive in nearly any conditions. Are you going away on vacation for two weeks? The snake plant will be healthy and waiting when you return. I ignore mine most of the time, yet it thrives. Chinese legend tells us that snake plants bestow long life, prosperity, intelligence, strength, health, beauty, art, and strength on your home. I love the simple lines and lush vegetation of the peace lily. When it blooms, there is no plant more beautiful. The foliage is bronze-green with a showy white sheath that rises above the green like a white flag. 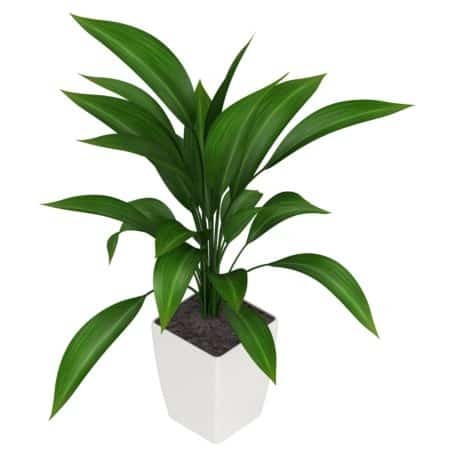 The plant needs little care and returns the favor by cleaning and oxygenating the air in your home. 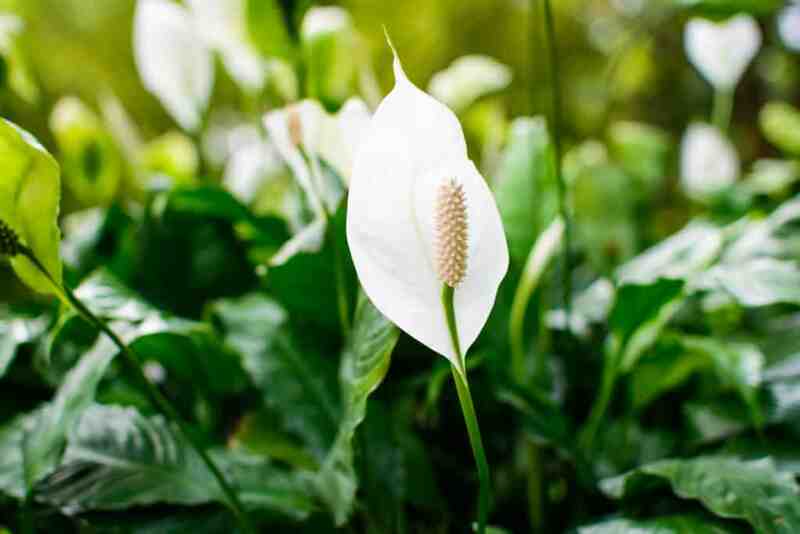 However, peace lily is not pet-friendly. The spider plant makes one of the best hanging plants. I love to see the baby plants hanging down from the mother plant like little satellites. It also works well on a tabletop or in groupings, sending out baby plants to add charm and a lacy edge. 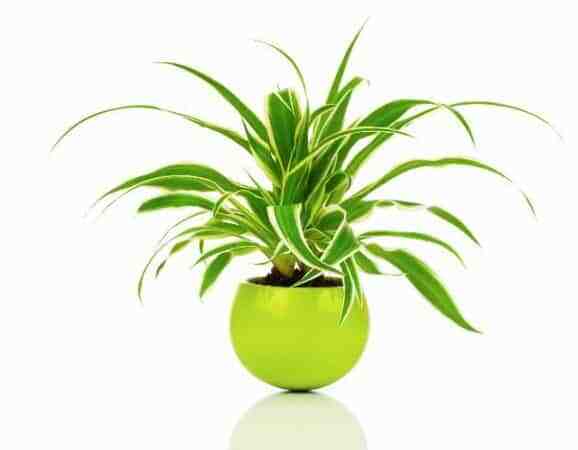 The spider plant loves high humidity, so it is one of the best houseplants for low light bathroom conditions. In other rooms, give them a light misting daily. Called the prayer plant because of the way the plants open during the day and close at night, many of these plants display an interesting pattern of color and shapes. There are many variations of patterns and colors, but all prefer low light. Keep them happy, and they will reward you with a bouquet of tiny flowers. 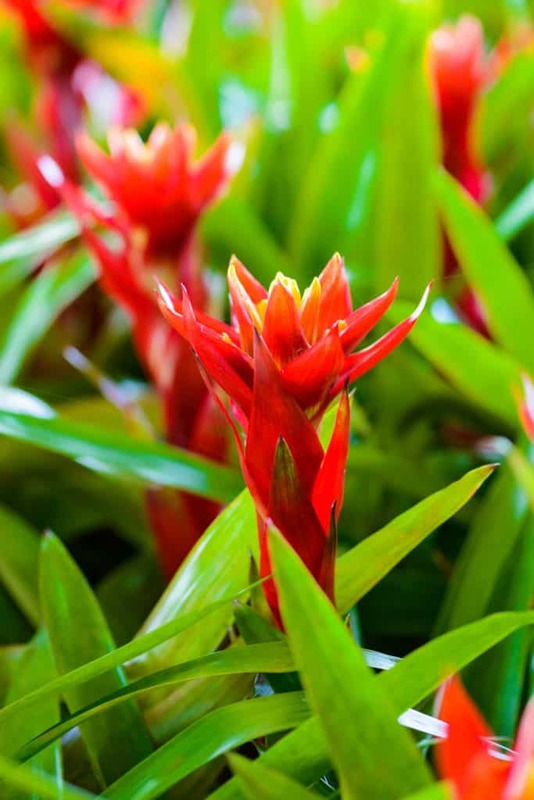 Easy to grow and care for, bromeliads are an interesting choice for low light conditions. They come in a variety of color patterns and produce a spectacular flower with a little care. Some grow as “air plants” without soil, while others enjoy a deep pot. Bromeliads love humidity. I love the way their colors and texture add interest to any room. 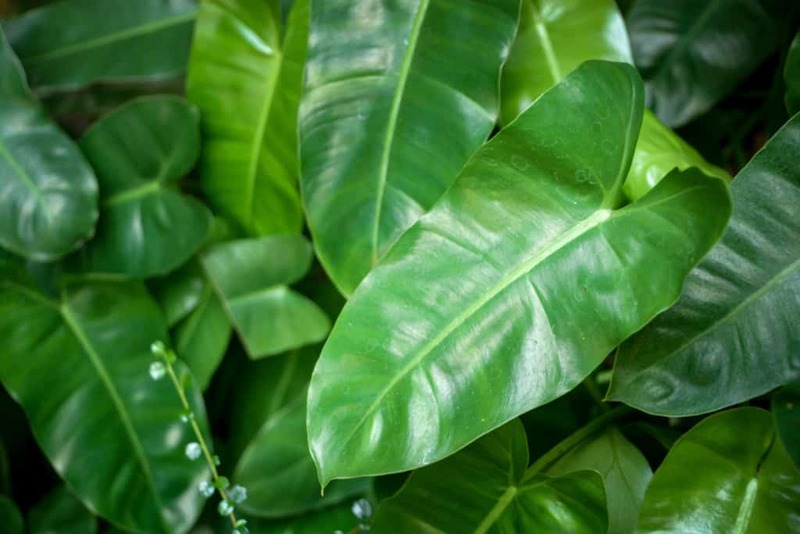 >> Extra Houseplants Tip: Check out hydrogen peroxide for plants to prevent fungal infections on plants. Ferns have been grown as houseplants for many years because they thrive in low light spaces. I love them because they are easy to grow and they come in such a large variety of shapes and sizes. 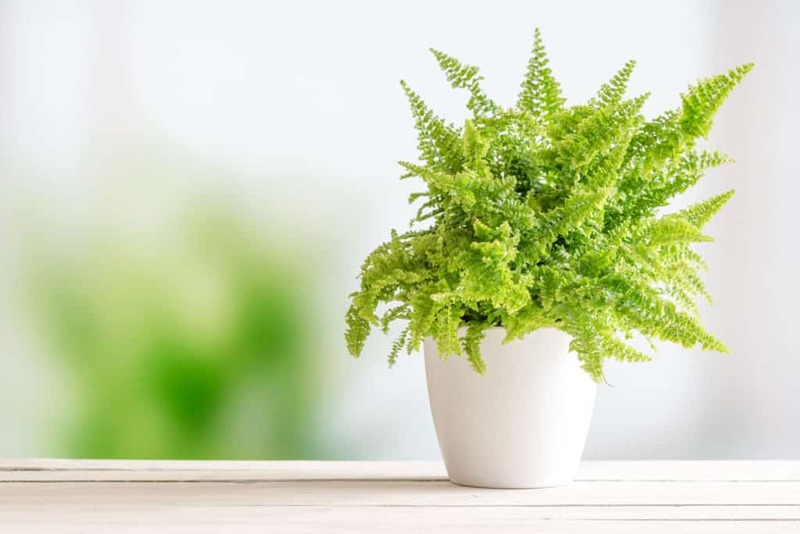 Along with being an amazing low light houseplant, ferns are among those plants that clean the air the most. I have a dainty fern growing in a teacup and a giant hanging basket with leaves that twist and turn in every direction. Ferns are like friends that will be there for you through all of life’s joys and sorrows. I love the way Calathea weaves dramatic patterns into the leaves. The designs range from simple stripes to intricate layers of swirling color. Some varieties have complex, but symmetrical designs of varying colors repeated on every leaf. Add a touch of green, pink, red, or purple to your tabletop. 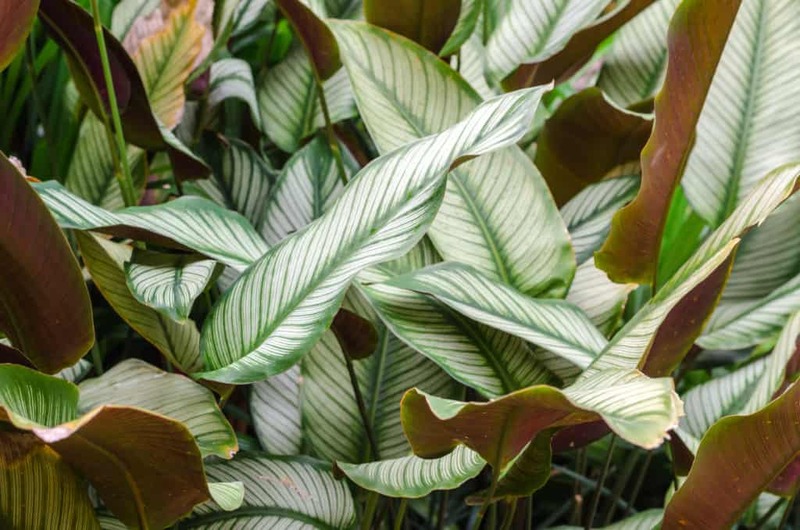 When you bring home a calathea, you are adding a piece of living art to your home. 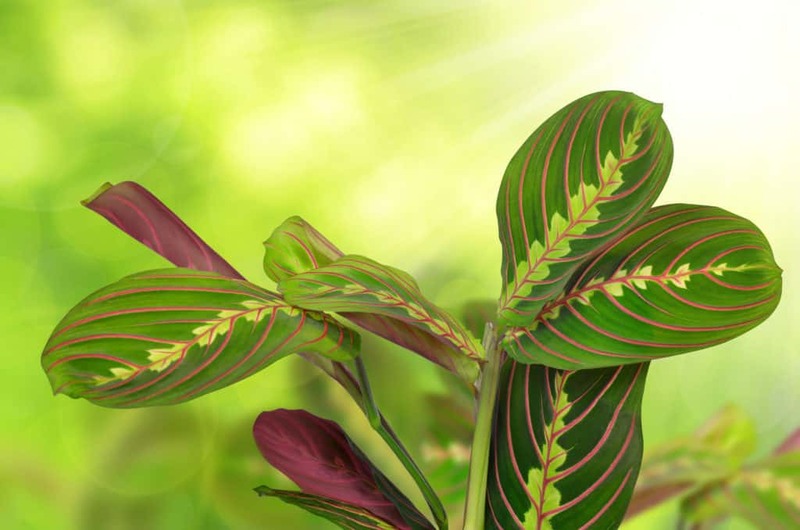 Keep Calathea away from the air conditioning vents; it loves warmth and humidity. The jade plant is my favorite succulent. The plant looks like a miniature tree with succulent leaves. I like it in a small pot, trimmed to a bonsai shape, but any form is attractive. 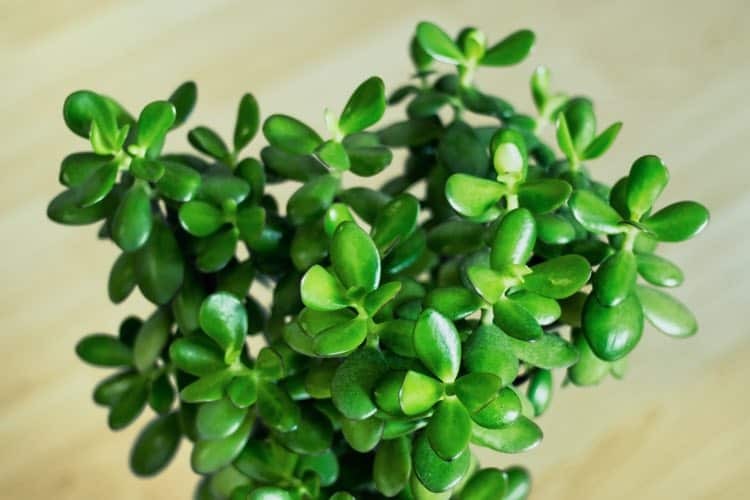 The jade tree is said to bring wealth to any home where it thrives. It is a very forgiving plant that brings rewards in many forms. 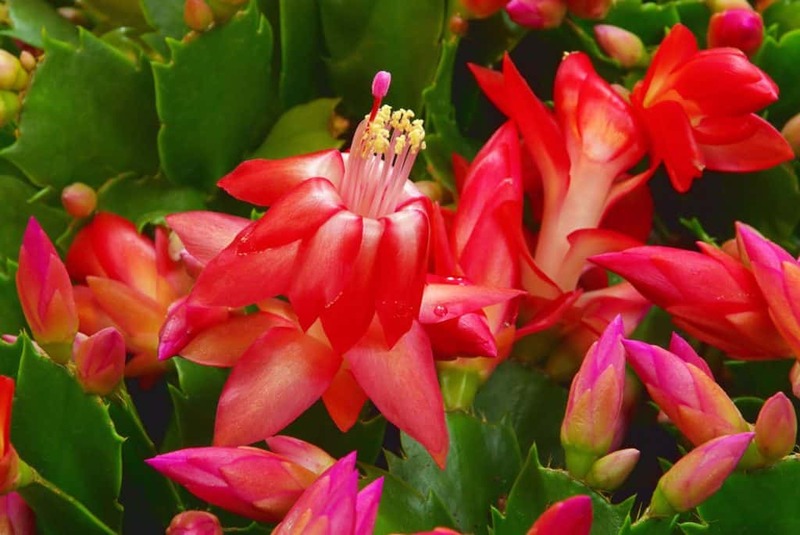 The Christmas cactus gives a beautiful display of color and blooms in the middle of winter. Blooms can occur anywhere from Thanksgiving to Easter, and the plant may bloom several times a year when it is happy. Christmas cactus makes an excellent hostess gift during the holidays because of its long-lasting flowers. It loves cooler temperatures and more water than most cactus but does great in low-light conditions. No green thumb required for this plant, and I love to give it to friends with busy lives. It draws its charm from deep green leaves and hidden flowers. It can survive extreme neglect where other plants would wither away, but it prefers plenty of water and an occasional dose of fertilizer. 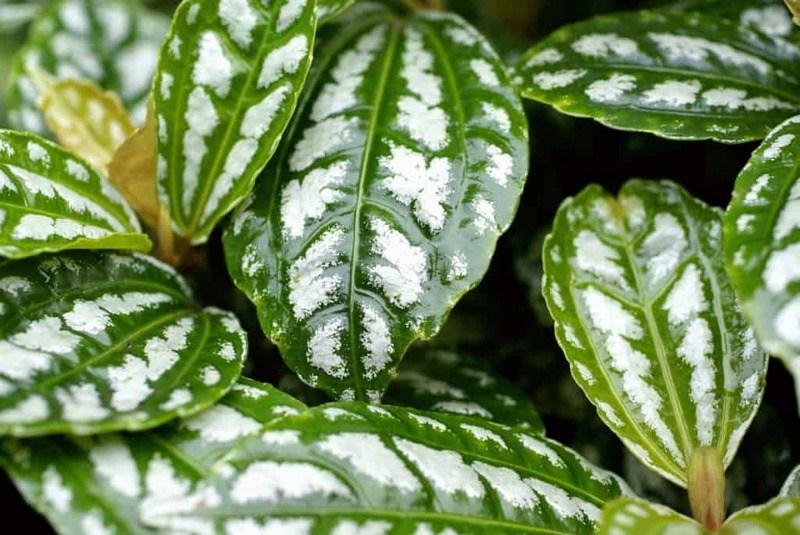 Chinese Evergreen is another tough plant that can take almost any growing conditions. It tolerates the abuse and neglect of our busy lives when it gets some occasional attention. While most varieties have leaves with variations of rich green and silver, you will also find red, pink, and golden yellow variations. It starts as a small tabletop plant but grows into a large showpiece with time and care. Syngonium goes by many names including goosefoot and arrowhead plant. 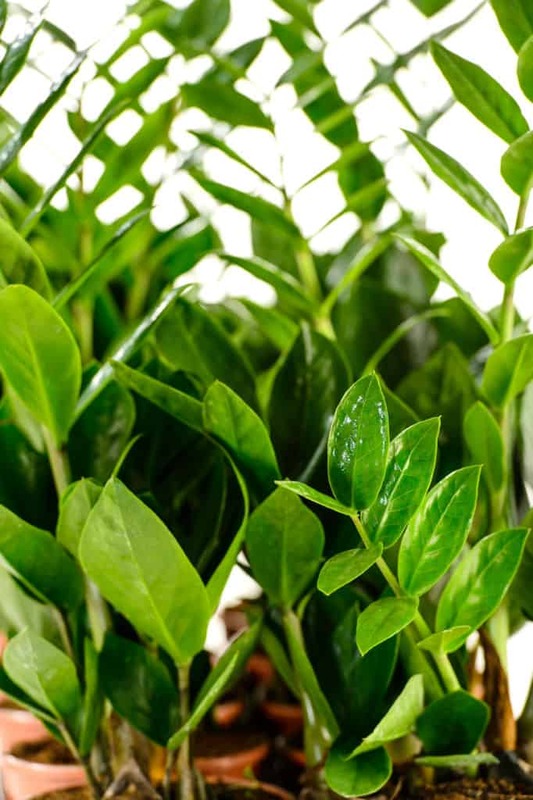 The plant grows full and bushy making it popular as a low-light houseplant. 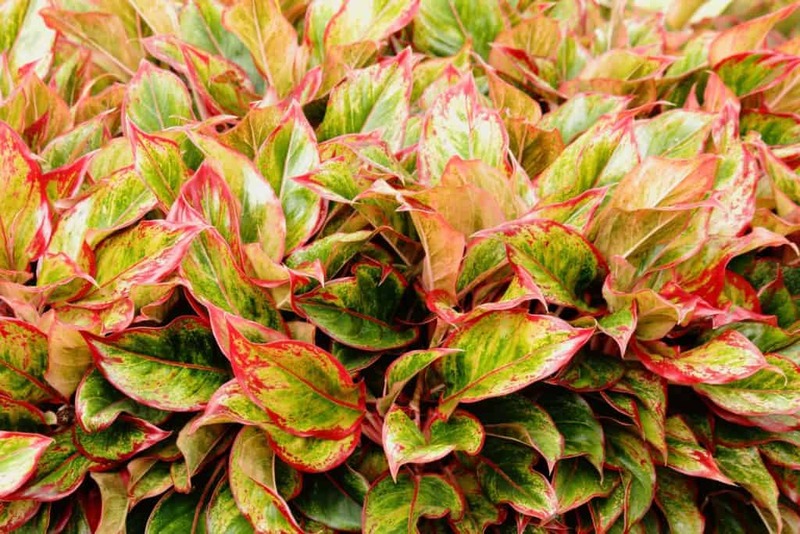 In warmer areas, it also considered one of the best ground cover plants. I love the beautiful variegated leaves tinted with pink, purple, silver, cream, or white. Goosefoot is a vining plant that grows quickly, and it can take over a room if allowed. Regular pruning keeps it in line. It is easy to see why ponytail palms are such popular houseplants. They are visually interesting with a bulbous base and long leaves sprouting like a ponytail at the top. 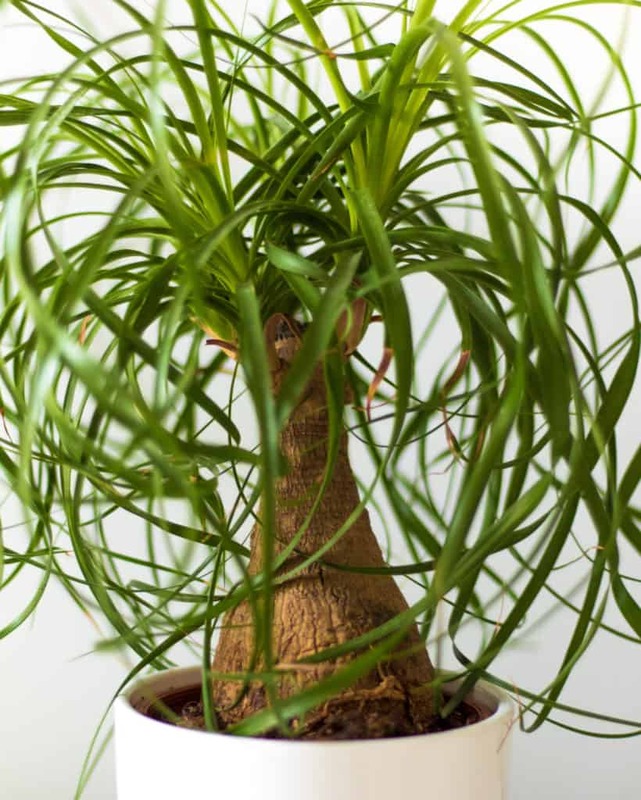 Ponytail palms can be purchased as small tabletop plants, and their growth is limited by the size of the container. Upgrading the pot every year will produce a large plant over several years. In my opinion, this is one of the best large houseplants for low light. Also known as the eternity plant and the ZeeZee plant, this interesting palm tolerates neglect and tough conditions very well. I love it because it grows slowly and doesn’t need a lot of care to keep it looking good. It is an exotic looking palm that comes in all sizes. The aluminum plant or watermelon plant is named for the interesting mix of silver and green on the leaves that look somewhat like miniature watermelons. Each leaf is different, giving you an unusual and attractive plant. Give them a trim every spring, and they’ll reward you with years of growth. The friendship plant is easily divided and shared with a friend. The leaves of this plant are interesting in color and texture. They can be found in bright green to silver shades and have a raised texture that is fun to touch. I especially love them because they are pet-friendly. 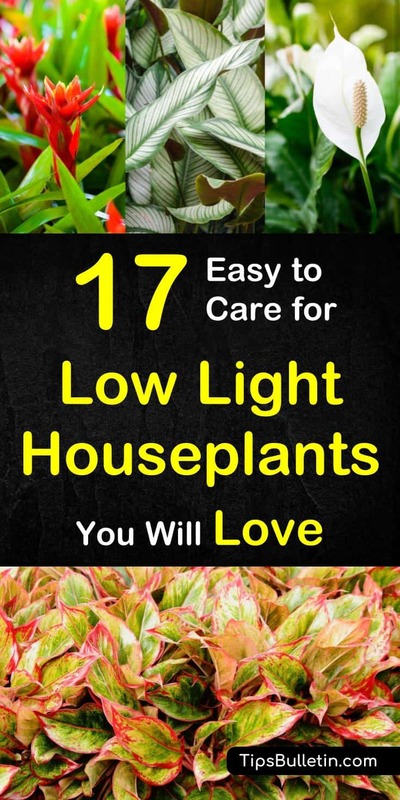 I hope that you enjoyed this list of low light houseplants and that you will grow some of them in your own home. You could probably tell that I prefer the plants that need very little care and plants with variations of color and texture. Hopefully, I have given you a list that will look good and thrive in your home. Pass this list on to your friends who have brown thumbs or give them one of these plants as a gift. We all need a little green in our lives. If you found this article to be helpful, please share it on your social media to help spread the word.